Provide safe and effective care in any type of long-term care setting! 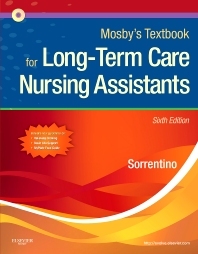 Mosby's Textbook for Long-Term Care Nursing Assistants provides a complete guide to the skills you need as a nursing assistant. More than 100 key procedures are described with clear, easy-to-learn instructions. Written by noted educator and author Sheila Sorrentino, this edition adds coverage that will help you care for residents with acute or chronic medical conditions.